Caps on the end of chromosomes // keep us supple when we’re young // and prevent cancer when we’re older // Can scientists make them do both at once? To cell biologists, the 1951 death of Henrietta Lacks, a 31-year-old mother of five, was a paradigm-shifting event. Until then, all human cells cultivated in the laboratory seemed to have finite life spans. For a while, cultured cells would replicate, producing exact copies right down to their DNA. But eventually the cells either stopped reproducing or died. This time, even though Lacks succumbed to cervical cancer, cells from her tumor lived on—becoming, in effect, immortal. That event, though it was decades before scientists learned what kept the tumor cells growing and dividing indefinitely, radically changed the understanding of both cancer and aging. But it seems to have created as many mysteries as it has solved. The riddles begin at the tips of our chromosomes, in a structure known as a telomere. Chromosomes—those 23 pairs of tightly wound strands of DNA—contain our genes, and the cell has many mechanisms to safeguard their well-being. 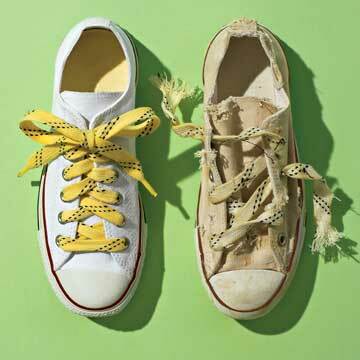 One of those is the telomere, which, like a plastic cap at the end of a shoelace, keeps chromosomes from fraying and genes from unraveling. But as we age, these tips shorten and eventually lose their protective power. When that happens, cells either undergo apoptosis (cell suicide), so they can be replaced by healthier cells, or they go into an inactive retirement called senescence. Senescent cells don’t die, but they no longer divide. In Jack W. Szostak’s laboratory at the Massachusetts General Hospital (MGH), Vicki Lundblad’s genetic studies in yeast have shown that maintaining telomere length is required to avoid cellular senescence. Counterintuitively, this loss of protective telomeres has a protective purpose: cancer prevention. Aging cells are more likely to become malignant, so limiting the natural active life span of a cell helps the whole organism live longer. The flip side of this cancer protection, though, is the woes of aging. It’s now suspected that the accumulation of senescent cells might account for much of what we hate about getting old—sagging skin; gray hair; loss of fertility; and a weakened immune system that, paradoxically, could heighten the risk of cancer. “It’s a case of what’s good for you when you’re young can harm you when you’re old,” says Judith Campisi, who researches cancer and aging at the Lawrence Berkeley National Laboratory in Berkeley, and the Buck Institute for Age Research in Novato, Calif.
Telomere shortening explains why cultured cells before those of Henrietta Lacks, which became known as HeLa cells, stopped dividing—they entered senescence. What made HeLa cells immortal is that they, like the vast majority of tumor cells, had stepped up the activity of the enzyme that repairs telomeres, called telomerase. An increased level of telomerase allows cancer cells to escape their natural life span limits and continue proliferating into tumors. Now researchers are trying to reconcile two intriguing but opposing therapeutic concepts. If too much telomerase in cancer cells promotes the disease, could we inhibit it to fight malignancies? Or, if having too little telomerase in normal cells leads to senescence, could we boost its levels to fight the effects of aging and—as some biotech and cosmetic companies are pursuing—remain forever young? Blackburn established that telomeres consist of repetitive DNA sequences and the proteins that bind them. Every time a cell divides, it copies each chromosome’s DNA except for the final few blocks of the telomere. That’s because, like a zipper, the enzymes that copy DNA cannot start at the bare end, but must begin a few teeth down. Each time the DNA is unzipped for copying, it loses the foot of the zipper and starts out shorter. So the older the person, the shorter the telomeres. essentially extending the zipper’s foot. Normally telomerase is most active early in life, keeping telomeres in good repair while cells divide furiously to keep up with growth and development. By adulthood, most tissues need their cells to divide only occasionally, and so the cells need infinitesimal amounts of telomerase. As a rule, only reproductive cells—eggs and sperm—and stem cells, which can replenish lost cells, must maintain significant levels of the enzyme. The exceptions to this rule are such tissues as skin, intestinal lining and bone marrow. In these, there’s rapid turnover and constant need to replenish cells damaged by ultraviolet radiation, wounds, digestive acids and infections. These self-replenishing tissues must have telomerase throughout adulthood, though at much lower levels than in early development. With age, though, telomerase cannot keep up with the demands of cell division. There’s less of the enzyme just when aging cells may need more. So telomeres become shorter, germ cells lose their fertility, and stem cells lose their capacity for self-renewal. That’s the start of what Blackburn describes as a “Dr. Jekyll and Mr. Hyde” role for telomerase in the life of both the cell and the organism. When a cell divides, so does its DNA. 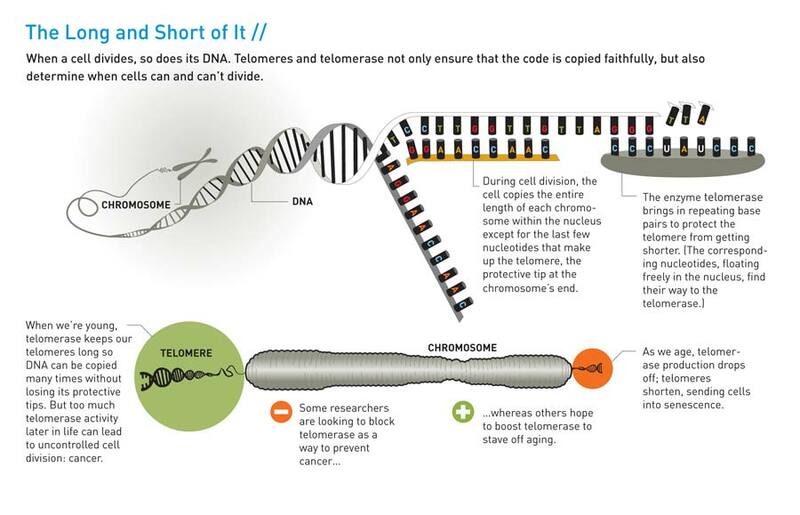 Telomeres and telomerase not only ensure that the code is copied faithfully, but also determine when cells can and can’t divide. 1. “Telomeres and Telomerase: The Path From Maize, Tetrahymena and Yeast to Human Cancer and Aging,” by Elizabeth H. Blackburn, Carol W. Greider and Jack W. Szostak, Nature Medicine, October 2006. The recipients of the 2009 Nobel Prize in Physiology or Medicine describe the interdisciplinary collaboration that led to the discovery of the structure of telomeres and the enzyme telomerase. 2. “The Common Biology of Cancer and Aging,” by Toren Finkel, Manuel Serrano and Maria Blasco, Nature Reviews, August 2007. A detailed review of research into how telomeres and telomerase underlie the biology of both cancer (a problem of uncontrolled cell division) and aging (one of cell senescence). When the powerhouses of cells—mitochondria—black out, a host of diseases ensue. The trick is to get them humming again. Is This Why We Get Old? Mitochondrial deterioration, fueled by free radicals, may speed the aging process. But the link is far from certain.